Ok. You just went under contract with a buyer of your rental property at what you think is a fantastic exit price. What do you do with your new windfall of equity value, and how do you think about the various options? Before we get to the question of what you can buy, you must first understand your purchasing power resulting from your asset sale. As a seller of real estate, you have two courses of action, each with its benefits and drawbacks. In the first alternative, using the 1031 Exchange process allows you to defer capital gains by escrowing the net sale proceeds and re-investing them directly into another real estate investment property. There will still be meaningful transaction fees to deduct from your proceeds, but the government will become a co-investor on your next venture, investing your deferred taxes alongside you in future ventures, but only taking their statutory share of the future gains on their investment. The drawbacks of this course of action are few, but critical in how they limit potential investment candidates. Legal limitations in the 1031 exchange process include a 45-day period after you sell the initial property in which to identify three (and only three) possible target investments, and thereafter, a 6-month window in which to close the transaction. Rarely are the perfect sale and the perfect new opportunity going to be timed with such precision. More likely, a market that is providing you with a great sale price will tend to make it very difficult to identify a subsequent investment property with exceptional economics and a great price. In the second alternative, a process we’ll call a ‘Full Exit’, you are free to redeploy the capital received from your asset sale however you see fit. The main drawback relative to the 1031 Exchange is that any re-investable proceeds will be net of any capital gains taxes. Bottom line is the net re-investible proceeds can be significantly lower than the first alternative, but the expanded horizon of opportunity cost can potentially offset these drawbacks. 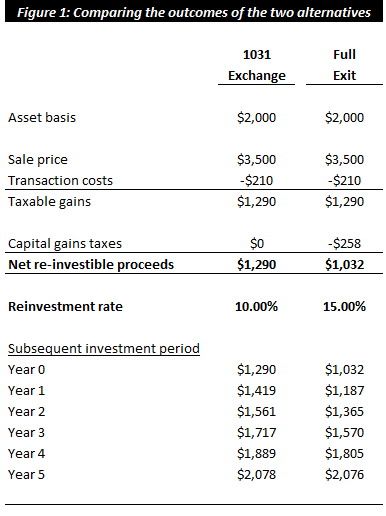 Figure 1 below details a hypothetical comparison of the two alternatives, the main difference being the reinvestment rate applied to the net re-investible proceeds. The difference in reinvestment rate assumption relies on the premise that there are simply more investment opportunities one can consider outside of a 1031 Exchange, and in practice it is likely you can find a better return scenario. As you can see, after 5 years, a subsequent investment at a higher rate has fully made up the ground of increased taxes paid. If the Full Exit is expected to continue compounding at a higher rate, one can easily see that despite paying taxes, the portfolio value will benefit in the long term. As depicted in Figure 1, the most effective method for considering for an appropriate course of action will be to evaluate the return profile of current exchange opportunities on a non-taxed basis, and to evaluate current (or potential future) non-real estate opportunities on a taxed basis. The analysis should be then carried forward for several years to estimate the true impact on portfolio value. The default answer shouldn’t be just to avoid taxes, but to carefully consider currently available investment opportunities, expected future opportunities, and a best guess at what course of action will maximize long-term outcomes. Although paying taxes in a Full Exit scenario certainly has its short-term pain, if the current 1031 Exchange opportunity set is poor, or if future expected opportunities are excellent, paying taxes on your gains may in fact be the best course of action. DRG property management specializes in optimizing rental property performance.